Frozen Statues, Perdition Games by L.E. Fraser is a one-of-a-kind psychological thriller with surprising twists, strong enough to give readers heart palpitations as they read on. It is winter, and seven freshmen from a Canadian university disappear and no one has any clue where they could be. Not until the police discovers a grisly crime scene — a frozen body with its eyes plucked out and replaced with black stones. While working on the first crime, another frozen body is discovered a week later in a similar setup. For police investigator Samantha McNamara, this could be a copycat of Incubus, the psychopath who murdered her sister three years earlier, and one she’s obsessed with. A letter from Incubus, who is securely locked up, opens a new line of investigation for her. Sam is driven to identify and catch the killer, but police inspector Reece Hash can’t just watch her proceed to her own destruction. The race is on to solve a complex crime before the murderer strikes again. And time is swiftly passing by! L.E. Fraser has just gone onto my list of favorite thriller writers with this novel, and although I won’t compare this author with Thomas Harris, L.E. Fraser has a unique signature for plot and character that had me rooting for her through every page. I was hooked at the very beginning of the story and couldn’t put it down. The vivid descriptions of scenes and setting, the depth of character development, the frequent twists in the plot, and the wonderful prose are elements that make this story stand out. Whether the narrative describes the reflection of a beam of light on the snow or a detail of the crime, the reader feels engaged. The reader is sucked into the world of the characters. 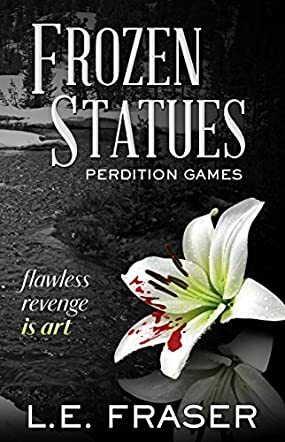 Frozen Statues, Perdition Games is a masterpiece, an absorbing story that defines its place in the area of crime and psychological thrillers.